By Jacques Natal, ex-stagiaire in Kawama and Twatasha Parishes. Handing over is quite common in parishes. It is now the turn of two of them which were under the care of the Missionaries of Africa since 1994 who took themselves over from the SMA Fathers. Those parishes are Twatasha and Kawama in Kitwe. It has been difficult for some Christians to understand this adjustment. Many felt sad even discouraged or apprehended tough time saying «Ba Diocesan balishupa sana» (meaning: diocesan priests are very tough). This decision was made some time ago between SAP Province and the Diocese of Ndola. A farewell party was organized in Kawama Parish on 4th and in Twatasha on 10th October 2015. The Christians recalled the dedication of the missionaries of Africa with their apostolic zeal, spiritual depth and social concerns. They were very grateful to them and promised to continue praying for them. 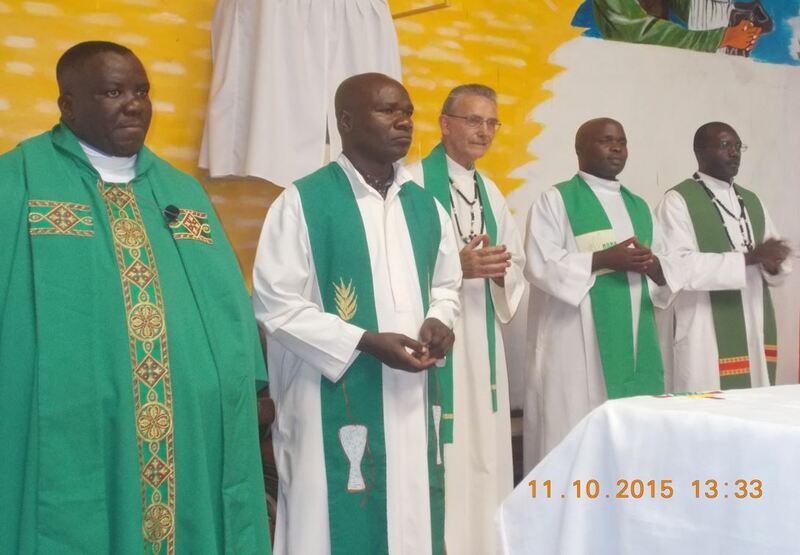 The final ceremony took place on 11th October 2015 in both parishes. Mass started in Kawama at 8hrs to proceed to Twatasha at 10hrs. As Bishop Alick Banda of Ndola Diocese was in Germany, Fr Chisenga, dean of Kitwe deanery, received the two parishes in the name of the Diocese. The names of the diocesan Priests chosen by the Bishop will be announced later on. Felix Kamunenge is foreseen for studies in the Philippines while Piet Van Heijst and the stagiaire Jacques Natal have already moved to Ndola on Friday 16th to create a new community with Reinhold Bloching. The ceremony of handing over was also attended by our Delegate Superior Babaine Venerato and Laurence Tukamushaba. May the good Lord be their guide in their journey as a new community!